Please visit the VHC STORE to purchase printed copies. If you have been blessed by this ministry, please consider contributing to its continued growth and outreach potential. Please note, this radio ministry is NOT a 501c3, which means we are not regulated by the government, nor are we able to give you a tax deductible receipt for any contributions. This Bible study guide is presented as an extension to our Virtual House Church. It is designed to show you how the themes, stories, and words of the Torah (the five books of Moses) are woven throughout the writings of the prophets and New Testament. There is much wisdom to be gained from the Torah. The word is often translated as “law” but really, it represents the instructions of our loving Father to His children. We pray this study draws you into a closer, more intimate relationship with Him. To view a PDF sample of this workbook CLICK HERE. © 2007 Zondervan King James Audio Bible. Performance Copyright © 2007 Zondervan. All rights reserved worldwide. Audio help. Free download. © 2007 All rights reserved. A Ministry of Fellowship for the Performing Arts The Holy Bible, King James Version. Recorded under licensing agreement. Audio help. 11 These things happened to them to serve as an example, and they were written down to instruct us, on whom the ends of the ages have come. How does this week’s Torah Portion relate to the Haftarah and Brit Chadasha Portions? What did you find most interesting about this week’s reading? What is the general theme of this reading and how does it apply to our lives today? 1 And at the revolution of the year the sons of Jacob journeyed from Shechem, and they came to Hebron, to their father Isaac, and they dwelt there, but their flocks and herds they fed daily in Shechem, for there was there in those days good and fat pasture, and Jacob and his sons and all their household dwelt in the valley of Hebron. 2 And it was in those days, in that year, being the hundred and sixth year of the life of Jacob, in the tenth year of Jacob's coming from Padan-aram, that Leah the wife of Jacob died; she was fifty-one years old when she died in Hebron. 3 And Jacob and his sons buried her in the cave of the field of Machpelah, which is in Hebron, which Abraham had bought from the children of Heth, for the possession of a burial place. 4 And the sons of Jacob dwelt with their father in the valley of Hebron, and all the inhabitants of the land knew their strength and their fame went throughout the land. 5 And Joseph the son of Jacob, and his brother Benjamin, the sons of Rachel, the wife of Jacob, were yet young in those days, and did not go out with their brethren during their battles in all the cities of the Amorites. 6 And when Joseph saw the strength of his brethren, and their greatness, he praised them and extolled them, but he ranked himself greater than them, and extolled himself above them; and Jacob, his father, also loved him more than any of his sons, for he was a son of his old age, and through his love toward him, he made him a coat of many colors. 7 And when Joseph saw that his father loved him more than his brethren, he continued to exalt himself above his brethren, and he brought unto his father evil reports concerning them. 8 And the sons of Jacob seeing the whole of Joseph's conduct toward them, and that their father loved him more than any of them, they hated him and could not speak peaceably to him all the days. 9 And Joseph was seventeen years old, and he was still magnifying himself above his brethren, and thought of raising himself above them. 10 At that time he dreamed a dream, and he came unto his brothers and told them his dream, and he said unto them, I dreamed a dream, and behold we were all binding sheaves in the field, and my sheaf rose and placed itself upon the ground and your sheaves surrounded it and bowed down to it. 11 And his brethren answered him and said unto him, What meaneth this dream that thou didst dream? dost thou imagine in thy heart to reign or rule over us? 12 And he still came, and told the thing to his father Jacob, and Jacob kissed Joseph when he heard these words from his mouth, and Jacob blessed Joseph. 13 And when the sons of Jacob saw that their father had blessed Joseph and had kissed him, and that he loved him exceedingly, they became jealous of him and hated him the more. 14 And after this Joseph dreamed another dream and related the dream to his father in the presence of his brethren, and Joseph said unto his father and brethren, Behold I have again dreamed a dream, and behold the sun and the moon and the eleven stars bowed down to me. 15 And his father heard the words of Joseph and his dream, and seeing that his brethren hated Joseph on account of this matter, Jacob therefore rebuked Joseph before his brethren on account of this thing, saying, What meaneth this dream which thou hast dreamed, and this magnifying thyself before thy brethren who are older than thou art? 16 Dost thou imagine in thy heart that I and thy mother and thy eleven brethren will come and bow down to thee, that thou speakest these things? 17 And his brethren were jealous of him on account of his words and dreams, and they continued to hate him, and Jacob reserved the dreams in his heart. 18 And the sons of Jacob went one day to feed their father's flock in Shechem, for they were still herdsmen in those days; and whilst the sons of Jacob were that day feeding in Shechem they delayed, and the time of gathering in the cattle was passed, and they had not arrived. 19 And Jacob saw that his sons were delayed in Shechem, and Jacob said within himself, Peradventure the people of Shechem have risen up to fight against them, therefore they have delayed coming this day. 20 And Jacob called Joseph his son and commanded him, saying, Behold thy brethren are feeding in Shechem this day, and behold they have not yet come back; go now therefore and see where they are, and bring me word back concerning the welfare of thy brethren and the welfare of the flock. 21 And Jacob sent his son Joseph to the valley of Hebron, and Joseph came for his brothers to Shechem, and could not find them, and Joseph went about the field which was near Shechem, to see where his brothers had turned, and he missed his road in the wilderness, and knew not which way he should go. 22 And an angel of the Lord found him wandering in the road toward the field, and Joseph said unto the angel of the Lord, I seek my brethren; hast thou not heard where they are feeding? and the angel of the Lord said unto Joseph, I saw thy brethren feeding here, and I heard them say they would go to feed in Dothan. 23 And Joseph hearkened to the voice of the angel of the Lord, and he went to his brethren in Dothan and he found them in Dothan feeding the flock. 24 And Joseph advanced to his brethren, and before he had come nigh unto them, they had resolved to slay him. 25 And Simeon said to his brethren, Behold the man of dreams is coming unto us this day, and now therefore come and let us kill him and cast him in one of the pits that are in the wilderness, and when his father shall seek him from us, we will say an evil beast has devoured him. 26 And Reuben heard the words of his brethren concerning Joseph, and he said unto them, You should not do this thing, for how can we look up to our father Jacob? Cast him into this pit to die there, but stretch not forth a hand upon him to spill his blood; and Reuben said this in order to deliver him from their hand, to bring him back to his father. 27 And when Joseph came to his brethren he sat before them, and they rose upon him and seized him and smote him to the earth, and stripped the coat of many colors which he had on. 28 And they took him and cast him into a pit, and in the pit there was no water, but serpents and scorpions. And Joseph was afraid of the serpents and scorpions that were in the pit. And Joseph cried out with a loud voice, and the Lord hid the serpents and scorpions in the sides of the pit, and they did no harm unto Joseph. 29 And Joseph called out from the pit to his brethren, and said unto them, What have I done unto you, and in what have I sinned? why do you not fear the Lord concerning me? am I not of your bones and flesh, and is not Jacob your father, my father? why do you do this thing unto me this day, and how will you be able to look up to our father Jacob? 30 And he continued to cry out and call unto his brethren from the pit, and he said, O Judah, Simeon, and Levi, my brethren, lift me up from the place of darkness in which you have placed me, and come this day to have compassion on me, ye children of the Lord, and sons of Jacob my father. And if I have sinned unto you, are you not the sons of Abraham, Isaac, and Jacob? if they saw an orphan they had compassion over him, or one that was hungry, they gave him bread to eat, or one that was thirsty, they gave him water to drink, or one that was naked, they covered him with garments! 31 And how then will you withhold your pity from your brother, for I am of your flesh and bones, and if I have sinned unto you, surely you will do this on account of my father! 32 And Joseph spoke these words from the pit, and his brethren could not listen to him, nor incline their ears to the words of Joseph, and Joseph was crying and weeping in the pit. 33 And Joseph said, O that my father knew, this day, the act which my brothers have done unto me, and the words which they have this day spoken unto me. 34 And all his brethren heard his cries and weeping in the pit, and his brethren went and removed themselves from the pit, so that they might not hear the cries of Joseph and his weeping in the pit. 1 And they went and sat on the opposite side, about the distance of a bow-shot, and they sat there to eat bread, and whilst they were eating, they held counsel together what was to be done with him, whether to slay him or to bring him back to his father. 2 They were holding the counsel, when they lifted up their eyes, and saw, and behold there was a company of Ishmaelites coming at a distance by the road of Gilead, going down to Egypt. 4 Now therefore, come let us dispose of him to them, and let not our hand be upon him, and they will lead him along with them, and he will be lost amongst the people of the land, and we will not put him to death with our own hands. And the proposal pleased his brethren and they did according to the word of Judah. 5 And whilst they were discoursing about this matter, and before the company of Ishmaelites had come up to them, seven trading men of Midian passed by them, and as they passed they were thirsty, and they lifted up their eyes and saw the pit in which Joseph was immured, and they looked, and behold every species of bird was upon him. 6 And these Midianites ran to the pit to drink water, for they thought that it contained water, and on coming before the pit they heard the voice of Joseph crying and weeping in the pit, and they looked down into the pit, and they saw and behold there was a youth of comely appearance and well favored. 7 And they called unto him and said, Who art thou and who brought thee hither, and who placed thee in this pit, in the wilderness? and they all assisted to raise up Joseph and they drew him out, and brought him up from the pit, and took him and went away on their journey and passed by his brethren. 8 And these said unto them, Why do you do this, to take our servant from us and to go away? surely we placed this youth in the pit because he rebelled against us, and you come and bring him up and lead him away; now then give us back our servant. 9 And the Midianites answered and said unto the sons of Jacob, Is this your servant, or does this man attend you? peradventure you are all his servants, for he is more comely and well favored than any of you, and why do you all speak falsely unto us? 10 Now therefore we will not listen to your words, nor attend to you, for we found the youth in the pit in the wilderness, and we took him; we will therefore go on. 11 And all the sons of Jacob approached them and rose up to them and said unto them, Give us back our servant, and why will you all die by the edge of the sword? And the Midianites cried out against them, and they drew their swords, and approached to fight with the sons of Jacob. 12 And behold Simeon rose up from his seat against them, and sprang upon the ground and drew his sword and approached the Midianites and he gave a terrible shout before them, so that his shouting was heard at a distance, and the earth shook at Simeon's shouting. 13 And the Midianites were terrified on account of Simeon and the noise of his shouting, and they fell upon their faces, and were excessively alarmed. 14 And Simeon said unto them, Verily I am Simeon, the son of Jacob the Hebrew, who have, only with my brother, destroyed the city of Shechem and the cities of the Amorites; so shall God moreover do unto me, that if all your brethren the people of Midian, and also the kings of Canaan, were to come with you, they could not fight against me. 15 Now therefore give us back the youth whom you have taken, lest I give your flesh to the birds of the skies and the beasts of the earth. 17 Surely you have said that the young man is your servant, and that he rebelled against you, and therefore you placed him in the pit; what then will you do with a servant who rebels against his master? Now therefore sell him unto us, and we will give you all that you require for him; and the Lord was pleased to do this in order that the sons of Jacob should not slay their brother. 18 And the Midianites saw that Joseph was of a comely appearance and well-favored; they desired him in their hearts and were urgent to purchase him from his brethren. 19 And the sons of Jacob hearkened to the Midianites and they sold their brother Joseph to them for twenty pieces of silver, and Reuben their brother was not with them, and the Midianites took Joseph and continued their journey to Gilead. 20 They were going along the road, and the Midianites repented of what they had done, in having purchased the young man, and one said to the other, What is this thing that we have done, in taking this youth from the Hebrews, who is of comely appearance and well favored. 21 Perhaps this youth is stolen from the land of the Hebrews, and why then have we done this thing? and if he should be sought for and found in our hands we shall die through him. 22 Now surely hardy and powerful men have sold him to us, the strength of one of whom you saw this day; perhaps they stole him from his land with their might and with their powerful arm, and have therefore sold him to us for the small value which we gave unto them. 23 And whilst they were thus discoursing together, they looked, and behold the company of Ishmaelites which was coming at first, and which the sons of Jacob saw, was advancing toward the Midianites, and the Midianites said to each other, Come let us sell this youth to the company of Ishmaelites who are coming toward us, and we will take for him the little that we gave for him, and we will be delivered from his evil. 24 And they did so, and they reached the Ishmaelites, and the Midianites sold Joseph to the Ishmaelites for twenty pieces of silver which they had given for him to his brethren. 25 And the Midianites went on their road to Gilead, and the Ishmaelites took Joseph and they let him ride upon one of the camels, and they were leading him to Egypt. 26 And Joseph heard that the Ishmaelites were proceeding to Egypt, and Joseph lamented and wept at this thing that he was to be so far removed from the land of Canaan, from his father, and he wept bitterly whilst he was riding upon the camel, and one of their men observed him, and made him go down from the camel and walk on foot, and notwithstanding this Joseph continued to cry and weep, and he said, O my father, my father. 27 And one of the Ishmaelites rose up and smote Joseph upon the cheek, and still he continued to weep; and Joseph was fatigued in the road, and was unable to proceed on account of the bitterness of his soul, and they all smote him and afflicted him in the road, and they terrified him in order that he might cease from weeping. 28 And the Lord saw the ambition of Joseph and his trouble, and the Lord brought down upon those men darkness and confusion, and the hand of every one that smote him became withered. 29 And they said to each other, What is this thing that God has done to us in the road? and they knew not that this befell them on account of Joseph. And the men proceeded on the road, and they passed along the road of Ephrath where Rachel was buried. 30 And Joseph reached his mother's grave, and Joseph hastened and ran to his mother's grave, and fell upon the grave and wept. 31 And Joseph cried aloud upon his mother's grave, and he said, O my mother, my mother, O thou who didst give me birth, awake now, and rise and see thy son, how he has been sold for a slave, and no one to pity him. 32 O rise and see thy son, weep with me on account of my troubles, and see the heart of my brethren. 33 Arouse my mother, arouse, awake from thy sleep for me, and direct thy battles against my brethren. O how have they stripped me of my coat, and sold me already twice for a slave, and separated me from my father, and there is no one to pity me. 34 Arouse and lay thy cause against them before God, and see whom God will justify in the judgment, and whom he will condemn. 35 Rise, O my mother, rise, awake from thy sleep and see my father how his soul is with me this day, and comfort him and ease his heart. 36 And Joseph continued to speak these words, and Joseph cried aloud and wept bitterly upon his mother's grave; and he ceased speaking, and from bitterness of heart he became still as a stone upon the grave. 38 My son, my son Joseph, I have heard the voice of thy weeping and the voice of thy lamentation; I have seen thy tears; I know thy troubles, my son, and it grieves me for thy sake, and abundant grief is added to my grief. 39 Now therefore my son, Joseph my son, hope to the Lord, and wait for him and do not fear, for the Lord is with thee, he will deliver thee from all trouble. 40 Rise my son, go down unto Egypt with thy masters, and do not fear, for the Lord is with thee, my son. And she continued to speak like unto these words unto Joseph, and she was still. 41 And Joseph heard this, and he wondered greatly at this, and he continued to weep; and after this one of the Ishmaelites observed him crying and weeping upon the grave, and his anger was kindled against him, and he drove him from there, and he smote him and cursed him. 42 And Joseph said unto the men, May I find grace in your sight to take me back to my father's house, and he will give you abundance of riches. 43 And they answered him, saying, Art thou not a slave, and where is thy father? and if thou hadst a father thou wouldst not already twice have been sold for a slave for so little value; and their anger was still roused against him, and they continued to smite him and to chastise him, and Joseph wept bitterly. 44 And the Lord saw Joseph's affliction, and Lord again smote these men, and chastised them, and the Lord caused darkness to envelope them upon the earth, and the lightning flashed and the thunder roared, and the earth shook at the voice of the thunder and of the mighty wind, and the men were terrified and knew not where they should go. 45 And the beasts and camels stood still, and they led them, but they would not go, they smote them, and they crouched upon the ground; and the men said to each other, What is this that God has done to us? what are our transgressions, and what are our sins that this thing has thus befallen us? 46 And one of them answered and said unto them, Perhaps on account of the sin of afflicting this slave has this thing happened this day to us; now therefore implore him strongly to forgive us, and then we shall know on whose account this evil befalleth us, and if God shall have compassion over us, then we shall know that all this cometh to us on account of the sin of afflicting this slave. 47 And the men did so, and they supplicated Joseph and pressed him to forgive them; and they said, We have sinned to the Lord and to thee, now therefore vouchsafe to request of thy God that he shall put away this death from amongst us, for we have sinned to him. 48 And Joseph did according to their words, and the Lord hearkened to Joseph, and the Lord put away the plague which he had inflicted upon those men on account of Joseph, and the beasts rose up from the ground and they conducted them, and they went on, and the raging storm abated and the earth became tranquilized, and the men proceeded on their journey to go down to Egypt, and the men knew that this evil had befallen them on account of Joseph. 49 And they said to each other, Behold we know that it was on account of his affliction that this evil befell us; now therefore why shall we bring this death upon our souls? Let us hold counsel what to do to this slave. 50 And one answered and said, Surely he told us to bring him back to his father; now therefore come, let us take him back and we will go to the place that he will tell us, and take from his family the price that we gave for him and we will then go away. 51 And one answered again and said, Behold this counsel is very good, but we cannot do so for the way is very far from us, and we cannot go out of our road. 52 And one more answered and said unto them, This is the counsel to be adopted, we will not swerve from it; behold we are this day going to Egypt, and when we shall have come to Egypt, we will sell him there at a high price, and we will be delivered from his evil. 53 And this thing pleased the men and they did so, and they continued their journey to Egypt with Joseph. 1 And when the sons of Jacob had sold their brother Joseph to the Midianites, their hearts were smitten on account of him, and they repented of their acts, and they sought for him to bring him back, but could not find him. 2 And Reuben returned to the pit in which Joseph had been put, in order to lift him out, and restore him to his father, and Reuben stood by the pit, and he heard not a word, and he called out Joseph! Joseph! and no one answered or uttered a word. 3 And Reuben said, Joseph has died through fright, or some serpent has caused his death; and Reuben descended into the pit, and he searched for Joseph and could not find him in the pit, and he came out again. 4 And Reuben tore his garments and he said, The child is not there, and how shall I reconcile my father about him if he be dead? and he went to his brethren and found them grieving on account of Joseph, and counseling together how to reconcile their father about him, and Reuben said unto his brethren, I came to the pit and behold Joseph was not there, what then shall we say unto our father, for my father will only seek the lad from me. 5 And his brethren answered him saying, Thus and thus we did, and our hearts afterward smote us on account of this act, and we now sit to seek a pretext how we shall reconcile our father to it. 6 And Reuben said unto them, What is this you have done to bring down the grey hairs of our father in sorrow to the grave? the thing is not good, that you have done. 7 And Reuben sat with them, and they all rose up and swore to each other not to tell this thing unto Jacob, and they all said, The man who will tell this to our father or his household, or who will report this to any of the children of the land, we will all rise up against him and slay him with the sword. 8 And the sons of Jacob feared each other in this matter, from the youngest to the oldest, and no one spoke a word, and they concealed the thing in their hearts. 9 And they afterward sat down to determine and invent something to say unto their father Jacob concerning all these things. 10 And Issachar said unto them, Here is an advice for you if it seem good in your eyes to do this thing, take the coat which belongeth to Joseph and tear it, and kill a kid of the goats and dip it in its blood. 11 And send it to our father and when he seeth it he will say an evil beast has devoured him, therefore tear ye his coat and behold his blood will be upon his coat, and by your doing this we shall be free of our father's murmurings. 12 And Issachar's advice pleased them, and they hearkened unto him and they did according to the word of Issachar which he had counselled them. 14 We had gathered in the cattle and had come as far as the road to Shechem and farther, when we found this coat upon the road in the wilderness dipped in blood and in dust; now therefore know whether it be thy son's coat or not. 15 And Naphtali went and he came unto his father and he gave him the coat, and he spoke unto him all the words which his brethren had commanded him. 16 And Jacob saw Joseph's coat and he knew it and he fell upon his face to the ground, and became as still as a stone, and he afterward rose up and cried out with a loud and weeping voice and he said, It is the coat of my son Joseph! 17 And Jacob hastened and sent one of his servants to his sons, who went to them and found them coming along the road with the flock. 18 And the sons of Jacob came to their father about evening, and behold their garments were torn and dust was upon their heads, and they found their father crying out and weeping with a loud voice. 19 And Jacob said unto his sons, Tell me truly what evil have you this day suddenly brought upon me? and they answered their father Jacob, saying, We were coming along this day after the flock had been gathered in, and we came as far as the city of Shechem by the road in the wilderness, and we found this coat filled with blood upon the ground, and we knew it and we sent unto thee if thou couldst know it. 20 And Jacob heard the words of his sons and he cried out with a loud voice, and he said, It is the coat of my son, an evil beast has devoured him; Joseph is rent in pieces, for I sent him this day to see whether it was well with you and well with the flocks and to bring me word again from you, and he went as I commanded him, and this has happened to him this day whilst I thought my son was with you. 21 And the sons of Jacob answered and said, He did not come to us, neither have we seen him from the time of our going out from thee until now. 23 Joseph my son, O my son Joseph, I sent thee this day after the welfare of thy brethren, and behold thou hast been torn in pieces; through my hand has this happened to my son. 24 It grieves me for thee Joseph my son, it grieves me for thee; how sweet wast thou to me during life, and now how exceedingly bitter is thy death to me. 25 0 that I had died in thy stead Joseph my son, for it grieves me sadly for thee my son, O my son, my son. Joseph my son, where art thou, and where hast thou been drawn? arouse, arouse from thy place, and come and see my grief for thee, O my son Joseph. 26 Come now and number the tears gushing from my eyes down my cheeks, and bring them up before the Lord, that his anger may turn from me. 27 0 Joseph my son, how didst thou fall, by the hand of one by whom no one had fallen from the beginning of the world unto this day; for thou hast been put to death by the smiting of an enemy, inflicted with cruelty, but surely I know that this has happened to thee, on account of the multitude of my sins. 28 Arouse now and see how bitter is my trouble for thee my son, although I did not rear thee, nor fashion thee, nor give thee breath and soul, but it was God who formed thee and built thy bones and covered them with flesh, and breathed in thy nostrils the breath of life, and then he gave thee unto me. 30 And Jacob continued to speak like unto these words concerning Joseph, and he wept bitterly; he fell to the ground and became still. 31 And all the sons of Jacob seeing their father's trouble, they repented of what they had done, and they also wept bitterly. 32 And Judah rose up and lifted his father's head from the ground, and placed it upon his lap, and he wiped his father's tears from his cheeks, and Judah wept an exceeding great weeping, whilst his father's head was reclining upon his lap, still as a stone. 33 And the sons of Jacob saw their father's trouble, and they lifted up their voices and continued to weep, and Jacob was yet lying upon the ground still as a stone. 34 And all his sons and his servants and his servant's children rose up and stood round him to comfort him, and he refused to be comforted. 35 And the whole household of Jacob rose up and mourned a great mourning on account of Joseph and their father's trouble, and the intelligence reached Isaac, the son of Abraham, the father of Jacob, and he wept bitterly on account of Joseph, he and all his household, and he went from the place where he dwelt in Hebron, and his men with him, and he comforted Jacob his son, and he refused to be comforted. 36 And after this, Jacob rose up from the ground, and his tears were running down his cheeks, and he said unto his sons, Rise up and take your swords and your bows, and go forth into the field, and seek whether you can find my son's body and bring it unto me that I may bury it. 37 Seek also, I pray you, among the beasts and hunt them, and that which shall come the first before you seize and bring it unto me, perhaps the Lord will this day pity my affliction, and prepare before you that which did tear my son in pieces, and bring it unto me, and I will avenge the cause of my son. 38 And his sons did as their father had commanded them, and they rose up early in the morning, and each took his sword and his bow in his hand, and they went forth into the field to hunt the beasts. 39 And Jacob was still crying aloud and weeping and walking to and fro in the house, and smiting his hands together, saying, Joseph my son, Joseph my son. 40 And the sons of Jacob went into the wilderness to seize the beasts, and behold a wolf came toward them, and they seized him, and brought him unto their father, and they said unto him, This is the first we have found, and we have brought him unto thee as thou didst command us, and thy son's body we could not find. 41 And Jacob took the beast from the hands of his sons, and he cried out with a loud and weeping voice, holding the beast in his hand, and he spoke with a bitter heart unto the beast, Why didst thou devour my son Joseph, and how didst thou have no fear of the God of the earth, or of my trouble for my son Joseph? 42 And thou didst devour my son for naught, because he committed no violence, and didst thereby render me culpable on his account, therefore God will require him that is persecuted. 44 As God liveth who created us in the earth, and as thy soul liveth, my lord, I did not see thy son, neither did I tear him to pieces, but from a distant land I also came to seek my son who went from me this day, and I know not whether he be living or dead. 45 And I came this day into the field to seek my son, and your sons found me, and seized me and increased my grief, and have this day brought me before thee, and I have now spoken all my words to thee. 46 And now therefore, O son of man, I am in thy hands, and do unto me this day as it may seem good in thy sight, but by the life of God who created me, I did not see thy son, nor did I tear him to pieces, neither has the flesh of man entered my mouth all the days of my life. 47 And when Jacob heard the words of the beast he was greatly astonished, and sent forth the beast from his hand, and she went her way. 48 And Jacob was still crying aloud and weeping for Joseph day after day, and he mourned for his son many days. 1 And the sons of Ishmael who had bought Joseph from the Midianites, who had bought him from his brethren, went to Egypt with Joseph, and they came upon the borders of Egypt, and when they came near unto Egypt, they met four men of the sons of Medan the son of Abraham, who had gone forth from the land of Egypt on their journey. 2 And the Ishmaelites said unto them, Do you desire to purchase this slave from us? and they said, Deliver him over to us, and they delivered Joseph over to them, and they beheld him, that he was a very comely youth and they purchased him for twenty shekels. 3 And the Ishmaelites continued their journey to Egypt and the Medanim also returned that day to Egypt, and the Medanim said to each other, Behold we have heard that Potiphar, an officer of Pharaoh, captain of the guard, seeketh a good servant who shall stand before him to attend him, and to make him overseer over his house and all belonging to him. 4 Now therefore come let us sell him to him for what we may desire, if he be able to give unto us that which we shall require for him. 5 And these Medanim went and came to the house of Potiphar, and said unto him, We have heard that thou seekest a good servant to attend thee, behold we have a servant that will please thee, if thou canst give unto us that which we may desire, and we will sell him unto thee. 6 And Potiphar said, Bring him before me, and I will see him, and if he please me I will give unto you that which you may require for him. 7 And the Medanim went and brought Joseph and placed him before Potiphar, and he saw him, and he pleased him exceedingly, and Potiphar said unto them, Tell me what you require for this youth? 8 And they said, Four hundred pieces of silver we desire for him, and Potiphar said, I will give it you if you bring me the record of his sale to you, and will tell me his history, for perhaps he may be stolen, for this youth is neither a slave, nor the son of a slave, but I observe in him the appearance of a goodly and handsome person. 9 And the Medanim went and brought unto him the Ishmaelites who had sold him to them, and they told him, saying, He is a slave and we sold him to them. 10 And Potiphar heard the words of the Ishmaelites in his giving the silver unto the Medanim, and the Medanim took the silver and went on their journey, and the Ishmaelites also returned home. 11 And Potiphar took Joseph and brought him to his house that he might serve him, and Joseph found favor in the sight of Potiphar, and he placed confidence in him, and made him overseer over his house, and all that belonged to him he delivered over into his hand. 12 And the Lord was with Joseph and he became a prosperous man, and the Lord blessed the house of Potiphar for the sake of Joseph. 13 And Potiphar left all that he had in the hand of Joseph, and Joseph was one that caused things to come in and go out, and everything was regulated by his wish in the house of Potiphar. 14 And Joseph was eighteen years old, a youth with beautiful eyes and of comely appearance, and like unto him was not in the whole land of Egypt. 15 At that time whilst he was in his master's house, going in and out of the house and attending his master, Zelicah, his master's wife, lifted up her eyes toward Joseph and she looked at him, and behold he was a youth comely and well favored. 16 And she coveted his beauty in her heart, and her soul was fixed upon Joseph, and she enticed him day after day, and Zelicah persuaded Joseph daily, but Joseph did not lift up his eyes to behold his master's wife. 17 And Zelicah said unto him, How goodly are thy appearance and form, truly I have looked at all the slaves, and have not seen so beautiful a slave as thou art; and Joseph said unto her, Surely he who created me in my mother's womb created all mankind. 18 And she said unto him, How beautiful are thine eyes, with which thou hast dazzled all the inhabitants of Egypt, men and women; and he said unto her, How beautiful they are whilst we are alive, but shouldst thou behold them in the grave, surely thou wouldst move away from them. 19 And she said unto him, How beautiful and pleasing are all thy words; take now, I pray thee, the harp which is in the house, and play with thy hands and let us hear thy words. 20 And he said unto her, How beautiful and pleasing are my words when I speak the praise of my God and his glory; and she said unto him, How very beautiful is the hair of thy head, behold the golden comb which is in the house, take it I pray thee, and curl the hair of thy head. 21 And he said unto her, How long wilt thou speak these words? cease to utter these words to me, and rise and attend to thy domestic affairs. 22 And she said unto him, There is no one in my house, and there is nothing to attend to but to thy words and to thy wish; yet notwithstanding all this, she could not bring Joseph unto her, neither did he place his eye upon her, but directed his eyes below to the ground. 23 And Zelicah desired Joseph in her heart, that he should lie with her, and at the time that Joseph was sitting in the house doing his work, Zelicah came and sat before him, and she enticed him daily with her discourse to lie with her, or ever to look at her, but Joseph would not hearken to her. 24 And she said unto him, If thou wilt not do according to my words, I will chastise thee with the punishment of death, and put an iron yoke upon thee. 25 And Joseph said unto her, Surely God who created man looseth the fetters of prisoners, and it is he who will deliver me from thy prison and from thy judgment. 26 And when she could not prevail over him, to persuade him, and her soul being still fixed upon him, her desire threw her into a grievous sickness. 27 And all the women of Egypt came to visit her, and they said unto her, Why art thou in this declining state? thou that lackest nothing; surely thy husband is a great and esteemed prince in the sight of the king, shouldst thou lack anything of what thy heart desireth? 28 And Zelicah answered them, saying, This day it shall be made known to you, whence this disorder springs in which you see me, and she commanded her maid servants to prepare food for all the women, and she made a banquet for them, and all the women ate in the house of Zelicah. 29 And she gave them knives to peel the citrons to eat them, and she commanded that they should dress Joseph in costly garments, and that he should appear before them, and Joseph came before their eyes and all the women looked on Joseph, and could not take their eyes from off him, and they all cut their hands with the knives that they had in their hands, and all the citrons that were in their hands were filled with blood. 30 And they knew not what they had done but they continued to look at the beauty of Joseph, and did not turn their eyelids from him. 31 And Zelicah saw what they had done, and she said unto them, What is this work that you have done? behold I gave you citrons to eat and you have all cut your hands. 32 And all the women saw their hands, and behold they were full of blood, and their blood flowed down upon their garments, and they said unto her, this slave in your house has overcome us, and we could not turn our eyelids from him on account of his beauty. 33 And she said unto them, Surely this happened to you in the moment that you looked at him, and you could not contain yourselves from him; how then can I refrain when he is constantly in my house, and I see him day after day going in and out of my house? how then can I keep from declining or even from perishing on account of this? 34 And they said unto her, the words are true, for who can see this beautiful form in the house and refrain from him, and is he not thy slave and attendant in thy house, and why dost thou not tell him that which is in thy heart, and sufferest thy soul to perish through this matter? 35 And she said unto them, I am daily endeavoring to persuade him, and he will not consent to my wishes, and I promised him everything that is good, and yet I could meet with no return from him; I am therefore in a declining state as you see. 36 And Zelicah became very ill on account of her desire toward Joseph, and she was desperately lovesick on account of him, and all the people of the house of Zelicah and her husband knew nothing of this matter, that Zelicah was ill on account of her love to Joseph. 37 And all the people of her house asked her, saying, Why art thou ill and declining, and lackest nothing? and she said unto them, I know not this thing which is daily increasing upon me. 38 And all the women and her friends came daily to see her, and they spoke with her, and she said unto them, This can only be through the love of Joseph; and they said unto her, Entice him and seize him secretly, perhaps he may hearken to thee, and put off this death from thee. 39 And Zelicah became worse from her love to Joseph, and she continued to decline, till she had scarce strength to stand. 40 And on a certain day Joseph was doing his master's work in the house, and Zelicah came secretly and fell suddenly upon him, and Joseph rose up against her, and he was more powerful than she, and he brought her down to the ground. 42 Hast thou ever heard, seen or known of so beautiful a woman as I am, or better than myself, who speak daily unto thee, fall into a decline through love for thee, confer all this honor upon thee, and still thou wilt not hearken to my voice? 43 And if it be through fear of thy master lest he punish thee, as the king liveth no harm shall come to thee from thy master through this thing; now, therefore pray listen to me, and consent for the sake of the honor which I have conferred upon thee, and put off this death from me, and why should I die for thy sake? and she ceased to speak. 44 And Joseph answered her, saying, Refrain from me, and leave this matter to my master; behold my master knoweth not what there is with me in the house, for all that belongeth to him he has delivered into my hand, and how shall I do these things in my master's house? 45 For he hath also greatly honored me in his house, and he hath also made me overseer over his house, and he hath exalted me, and there is no one greater in this house than I am, and my master hath refrained nothing from me, excepting thee who art his wife, how then canst thou speak these words unto me, and how can I do this great evil and sin to God and to thy husband? 46 Now therefore refrain from me, and speak no more such words as these, for I will not hearken to thy words. But Zelicah would not hearken to Joseph when he spoke these words unto her, but she daily enticed him to listen to her. 47 And it was after this that the brook of Egypt was filled above all its sides, and all the inhabitants of Egypt went forth, and also the king and princes went forth with timbrels and dances, for it was a great rejoicing in Egypt, and a holiday at the time of the inundation of the sea Sihor, and they went there to rejoice all the day. 48 And when the Egyptians went out to the river to rejoice, as was their custom, all the people of the house of Potiphar went with them, but Zelicah would not go with them, for she said, I am indisposed, and she remained alone in the house, and no other person was with her in the house. 49 And she rose up and ascended to her temple in the house, and dressed herself in princely garments, and she placed upon her head precious stones of onyx stones, inlaid with silver and gold, and she beautified her face and skin with all sorts of women's purifying liquids, and she perfumed the temple and the house with cassia and frankincense, and she spread myrrh and aloes, and she afterward sat in the entrance of the temple, in the passage of the house, through which Joseph passed to do his work, and behold Joseph came from the field, and entered the house to do his master's work. 50 And he came to the place through which he had to pass, and he saw all the work of Zelicah, and he turned back. 51 And Zelicah saw Joseph turning back from her, and she called out to him, saying What aileth thee Joseph? come to thy work, and behold I will make room for thee until thou shalt have passed to thy seat. 52 And Joseph returned and came to the house, and passed from thence to the place of his seat, and he sat down to do his master's work as usual and behold Zelicah came to him and stood before him in princely garments, and the scent from her clothes was spread to a distance. 53 And she hastened and caught hold of Joseph and his garments, and she said unto him, As the king liveth if thou wilt not perform my request thou shalt die this day, and she hastened and stretched forth her other hand and drew a sword from beneath her garments, and she placed it upon Joseph's neck, and she said, Rise and perform my request, and if not thou diest this day. 54 And Joseph was afraid of her at her doing this thing, and he rose up to flee from her, and she seized the front of his garments, and in the terror of his flight the garment which Zelicah seized was torn, and Joseph left the garment in the hand of Zelicah, and he fled and got out, for he was in fear. 55 And when Zelicah saw that Joseph's garment was torn, and that he had left it in her hand, and had fled, she was afraid of her life, lest the report should spread concerning her, and she rose up and acted with cunning, and put off the garments in which she was dressed, and she put on her other garments. 56 And she took Joseph's garment, and she laid it beside her, and she went and seated herself in the place where she had sat in her illness, before the people of her house had gone out to the river, and she called a young lad who was then in the house, and she ordered him to call the people of the house to her. 57 And when she saw them she said unto them with a loud voice and lamentation, See what a Hebrew your master has brought to me in the house, for he came this day to lie with me. 58 For when you had gone out he came to the house, and seeing that there was no person in the house, he came unto me, and caught hold of me, with intent to lie with me. 59 And I seized his garments and tore them and called out against him with a loud voice, and when I had lifted up my voice he was afraid of his life and left his garment before me, and fled. 60 And the people of her house spoke nothing, but their wrath was very much kindled against Joseph, and they went to his master and told him the words of his wile. 61 And Potiphar came home enraged, and his wife cried out to him, saying, What is this thing that thou hast done unto me in bringing a He. brew servant into my house, for he came unto me this day to sport with me; thus did he do unto me this day. 62 And Potiphar heard the words of his wife, and he ordered Joseph to be punished with severe stripes, and they did so to him. 63 And whilst they were smiting him, Joseph called out with a loud voice, and he lifted up his eyes to heaven, and he said, O Lord God, thou knowest that I am innocent of all these things, and why shall I die this day through falsehood, by the hand of these uncircumcised wicked men, whom thou knowest? 65 What do you want of this man, and why do you do this evil unto him? my mother speaketh falsely and uttereth lies; thus was the transaction. 66 And the child told them accurately all that happened, and all the words of Zelicah to Joseph day after day did he declare unto them. 67 And all the men heard the words of the child and they wondered greatly at the child's words, and the child ceased to speak and became still. 68 And Potiphar was very much ashamed at the words of his son, and he commanded his men not to beat Joseph any more, and the men ceased beating Joseph. 69 And Potiphar took Joseph and ordered him to be brought to justice before the priests, who were judges belonging to the king, in order to judge him concerning this affair. 70 And Potiphar and Joseph came before the priests who were the king's judges, and he said unto them, Decide I pray you, what judgment is due to a servant, for thus has he done. 71 And the priests said unto Joseph, Why didst thou do this thing to thy master? and Joseph answered them, saying, Not so my lords, thus was the matter; and Potiphar said unto Joseph, Surely I entrusted in thy hands all that belonged to me, and I withheld nothing from thee but my wife, and how couldst thou do this evil? 72 And Joseph answered saying, Not so my lord, as the Lord liveth, and as thy soul liveth, my lord, the word which thou didst hear from thy wife is untrue, for thus was the affair this day. 73 A year has elapsed to me since I have been in thy house; hast thou seen any iniquity in me, or any thing which might cause thee to demand my life? 74 And the priests said unto Potiphar, Send, we pray thee, and let them bring before us Joseph's torn garment, and let us see the tear in it, and if it shall be that the tear is in front of the garment, then his face must have been opposite to her and she must have caught hold of him, to come to her, and with deceit did thy wife do all that she has spoken. 75 And they brought Joseph's garment before the priests who were judges, and they saw and behold the tear was in front of Joseph, and all the judging priests knew that she had pressed him, and they said, The judgment of death is not due to this slave for he has done nothing, but his judgment is, that he be placed in the prison house on account of the report, which through him has gone forth against thy wife. 76 And Potiphar heard their words, and he placed him in the prison house, the place where the king's prisoners are confined, and Joseph was in the house of confinement twelve years. 77 And notwithstanding this, his master's wife did not turn from him, and she did not cease from speaking to him day after day to hearken to her, and at the end of three months Zelicah continued going to Joseph to the house of confinement day by day, and she enticed him to hearken to her, and Zelicah said unto Joseph, How long wilt thou remain in this house? but hearken now to my voice, and I will bring thee out of this house. 78 And Joseph answered her, saying, It is better for me to remain in this house than to hearken to thy words, to sin against God; and she said unto him, If thou wilt not perform my wish, I will pluck out thine eyes, add fetters to thy feet, and will deliver thee into the hands of them whom thou didst not know before. 79 And Joseph answered her and said, Behold the God of the whole earth is able to deliver me from all that thou canst do unto me, for he openeth the eyes of the blind, and looseth those that are bound, and preserveth all strangers who are unacquainted with the land. 80 And when Zelicah was unable to persuade Joseph to hearken to her, she left off going to entice him; and Joseph was still confined in the house of confinement. And Jacob the father of Joseph, and all his brethren who were in the land of Canaan still mourned and wept in those days on account of Joseph, for Jacob refused to be comforted for his son Joseph, and Jacob cried aloud, and wept and mourned all those days. 1 And it was at that time in that year, which is the year of Joseph's going down to Egypt after his brothers had sold him, that Reuben the son of Jacob went to Timnah and took unto him for a wife Eliuram, the daughter of Avi the Canaanite, and he came to her. 2 And Eliuram the wife of Reuben conceived and bare him Hanoch, Palu, Chetzron and Carmi, four sons; and Simeon his brother took his sister Dinah for a wife, and she bare unto him Memuel, Yamin, Ohad, Jachin and Zochar, five sons. 3 And he afterward came to Bunah the Canaanitish woman, the same is Bunah whom Simeon took captive from the city of Shechem, and Bunah was before Dinah and attended upon her, and Simeon came to her, and she bare unto him Saul. 4 And Judah went at that time to Adulam, and he came to a man of Adulam, and his name was Hirah, and Judah saw there the daughter of a man from Canaan, and her name was Aliyath, the daughter of Shua, and he took her, and came to her, and Aliyath bare unto Judah, Er, Onan and Shiloh; three sons. 5 And Levi and Issachar went to the land of the east, and they took unto themselves for wives the daughters of Jobab the son of Yoktan, the son of Eber; and Jobab the son of Yoktan had two daughters; the name of the elder was Adinah, and the name of the younger was Aridah. 6 And Levi took Adinah, and Issachar took Aridah, and they came to the land of Canaan, to their father's house, and Adinah bare unto Levi, Gershon, Kehath and Merari; three sons. 7 And Aridah bare unto Issachar Tola, Puvah, Job and Shomron, four sons; and Dan went to the land of Moab and took for a wife Aphlaleth, the daughter of Chamudan the Moabite, and he brought her to the land of Canaan. 8 And Aphlaleth was barren, she had no offspring, and God afterward remembered Aphlaleth the wife of Dan, and she conceived and bare a son, and she called his name Chushim. 9 And Gad and Naphtali went to Haran and took from thence the daughters of Amuram the son of Uz, the son of Nahor, for wives. 10 And these are the names of the daughters of Amuram; the name of the elder was Merimah, and the name of the younger Uzith; and Naphtali took Merimah, and Gad took Uzith; and brought them to the land of Canaan, to their father's house. 11 And Merimah bare unto Naphtali Yachzeel, Guni, Jazer and Shalem, four sons; and Uzith bare unto Gad Zephion, Chagi, Shuni, Ezbon, Eri, Arodi and Arali, seven sons. 12 And Asher went forth and took Adon the daughter of Aphlal, the son of Hadad, the son of Ishmael, for a wife, and he brought her to the land of Canaan. 13 And Adon the wife of Asher died in those days: she had no offspring; and it was after the death of Adon that Asher went to the other side of the river and took for a wife Hadurah the daughter of Abimael, the son of Eber, the son of Shem. 14 And the young woman was of a comely appearance, and a woman of sense, and she had been the wife of Malkiel the son of Elam, the son of Shem. 15 And Hadurah bare a daughter unto Malkiel, and he called her name Serach, and Malkiel died after this, and Hadurah went and remained in her father's house. 16 And after the death of the wife at Asher he went and took Hadurah for a wife, and brought her to the land of Canaan, and Serach her daughter he also brought with them, and she was three years old, and the damsel was brought up in Jacob's house. 17 And the damsel was of a comely appearance, and she went in the sanctified ways of the children of Jacob; she lacked nothing, and the Lord gave her wisdom and understanding. 18 And Hadurah the wife of Asher conceived and bare unto him Yimnah, Yishvah, Yishvi and Beriah; four sons. 19 And Zebulun went to Midian, and took for a wife Merishah the daughter of Molad, the son of Abida, the son of Midian, and brought her to the land of Canaan. 20 And Merushah bare unto Zebulun Sered, Elon and Yachleel; three sons. 21 And Jacob sent to Aram, the son of Zoba, the son of Terah, and he took for his son Benjamin Mechalia the daughter of Aram, and she came to the land of Canaan to the house of Jacob; and Benjamin was ten years old when he took Mechalia the daughter of Aram for a wife. 22 And Mechalia conceived and bare unto Benjamin Bela, Becher, Ashbel, Gera and Naaman, five sons; and Benjamin went afterward and took for a wife Aribath, the daughter of Shomron, the son of Abraham, in addition to his first wife, and he was eighteen years old; and Aribath bare unto Benjamin Achi, Vosh, Mupim, Chupim, and Ord; five sons. 23 And in those days Judah went to the house of Shem and took Tamar the daughter of Elam, the son of Shem, for a wife for his first born Er. 24 And Er came to his wife Tamar, and she became his wife, and when he came to her he outwardly destroyed his seed, and his work was evil in the sight of the Lord, and the Lord slew him. 25 And it was after the death of Er, Judah's first born, that Judah said unto Onan, go to thy brother's wife and marry her as the next of kin, and raise up seed to thy brother. 26 And Onan took Tamar for a wife and he came to her, and Onan also did like unto the work of his brother, and his work was evil in the sight of the Lord, and he slew him also. 27 And when Onan died, Judah said unto Tamar, Remain in thy father's house until my son Shiloh shall have grown up, and Judah did no more delight in Tamar, to give her unto Shiloh, for he said, Peradventure he will also die like his brothers. 28 And Tamar rose up and went and remained in her father's house, and Tamar was in her father's house for some time. 29 And at the revolution of the year, Aliyath the wife of Judah died; and Judah was comforted for his wife, and after the death of Aliyath, Judah went up with his friend Hirah to Timnah to shear their sheep. 30 And Tamar heard that Judah had gone up to Timnah to shear the sheep, and that Shiloh was grown up, and Judah did not delight in her. 31 And Tamar rose up and put off the garments of her widowhood, and she put a vail upon her, and she entirely covered herself, and she went and sat in the public thoroughfare, which is upon the road to Timnah. 32 And Judah passed and saw her and took her and he came to her, and she conceived by him, and at the time of being delivered, behold, there were twins in her womb, and he called the name of the first Perez, and the name of the second Zarah. 1 In those days Joseph was still confined in the prison house in the land of Egypt. 2 At that time the attendants of Pharaoh were standing before him, the chief of the butlers and the chief of the bakers which belonged to the king of Egypt. 3 And the butler took wine and placed it before the king to drink, and the baker placed bread before the king to eat, and the king drank of the wine and ate of the bread, he and his servants and ministers that ate at the king's table. 4 And whilst they were eating and drinking, the butler and the baker remained there, and Pharaoh's ministers found many flies in the wine, which the butler had brought, and stones of nitre were found in the baker's bread. 5 And the captain of the guard placed Joseph as an attendant on Pharaoh's officers, and Pharaoh's officers were in confinement one year. 6 And at the end of the year, they both dreamed dreams in one night, in the place of confinement where they were, and in the morning Joseph came to them to attend upon them as usual, and he saw them, and behold their countenances were dejected and sad. 7 And Joseph asked them, Why are your countenances sad and dejected this day? and they said unto him, We dreamed a dream, and there is no one to interpret it; and Joseph said unto them, Relate, I pray you, your dream unto me, and God shall give you an answer of peace as you desire. 8 And the butler related his dream unto Joseph, and he said, I saw in my dream, and behold a large vine was before me, and upon that vine I saw three branches, and the vine speedily blossomed and reached a great height, and its clusters were ripened and became grapes. 9 And I took the grapes and pressed them in a cup, and placed it in Pharaoh's hand and he drank; and Joseph said unto him, The three branches that were upon the vine are three days. 10 Yet within three days, the king will order thee to be brought out and he will restore thee to thy office, and thou shalt give the king his wine to drink as at first when thou wast his butler; but let me find favor in thy sight, that thou shalt remember me to Pharaoh when it will be well with thee, and do kindness unto me, and get me brought forth from this prison, for I was stolen away from the land of Canaan and was sold for a slave in this place. 11 And also that which was told thee concerning my master's wife is false, for they placed me in this dungeon for naught; and the butler answered Joseph, saying, If the king deal well with me as at first, as thou last interpreted to me, I will do all that thou desirest, and get thee brought out of this dungeon. 12 And the baker, seeing that Joseph had accurately interpreted the butler's dream, also approached, and related the whole of his dream to Joseph. 13 And he said unto him, In my dream I saw and behold three white baskets upon my head, and I looked, and behold there were in the upper-most basket all manner of baked meats for Pharaoh, and behold the birds were eating them from off my head. 14 And Joseph said unto him, The three baskets which thou didst see are three days, yet within three days Pharaoh will take off thy head, and hang thee upon a tree, and the birds will eat thy flesh from off thee, as thou sawest in thy dream. 15 In those days the queen was about to be delivered, and upon that day she bare a son unto the king of Egypt, and they proclaimed that the king had gotten his first born son and all the people of Egypt together with the officers and servants of Pharaoh rejoiced greatly. 16 And upon the third day of his birth Pharaoh made a feast for his officers and servants, for the hosts of the land of Zoar and of the land of Egypt. 17 And all the people of Egypt and the servants of Pharaoh came to eat and drink with the king at the feast of his son, and to rejoice at the king's rejoicing. 18 And all the officers of the king and his servants were rejoicing at that time for eight days at the feast, and they made merry with all sorts of musical instruments, with timbrels and with dances in the king's house for eight days. 19 And the butler, to whom Joseph had interpreted his dream, forgot Joseph, and he did not mention him to the king as he had promised, for this thing was from the Lord in order to punish Joseph because he had trusted in man. 20 And Joseph remained after this in the prison house two years, until he had completed twelve years. Who or what is an Archon? What was"The Genesis Six Experiment" about? 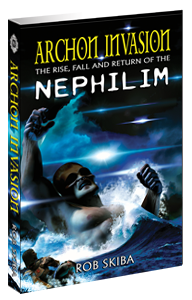 Who were the Nephilim? How did they return both before and after the Flood? What differentiates the days of Noah from the days of Jared? Were there female Nephilim? Could the giants reproduce? Why should we be concerned about the act of mixing animal and human DNA? Why did Jesus say the Last Days would be like the days of Noah? Find out in this information packed 366 page book by Rob Skiba!